Welcome to the website of the Theological Biblical Academy, a ministry in partnership with Grace Community Church missionaries. Browse around and read about the great things the Lord is doing here in Croatia. Below you will a brief description about the training center. TBA prepares men who are called to pastoral ministry to preach the Scriptures expositionally and integrate biblical principles into their ministries. We equip all of our students with a thorough understanding of God's Word so that they can serve faithfully and effectively in their churches. A relationship to a growing church, Emanuel Baptist Church, provides the men many opportunities for discipleship and personal preparation for local church ministry. The dream and vision for the founding of the Theological Biblical Academy in our territory became an historical reality in the summer of 1997. In that year, twelve church leaders of Reformed heritage decided to open an interdenominational and international theological-biblical institution for the purpose of educating and preparing God-fearing believers, called by God for various aspects of church ministry. The faculty and staff of TBA continue to weave into the lives of all their students those spiritual and biblical qualities which will contribute to quality, Bible-based evangelization of our region, to the planting of new churches, and to expository (verse by verse) interpretation of the Scriptures, so that church fellowships will be better grounded and rooted in the infallible, inerrant Word of God. TBA continues the long-standing traditon of the Evangelical Bible Institute, founded in Vienna, Austria in 1981, promoting evangelical convictions offering both full-time studies at the main center in Krapina as well as extension or part-time studies in Krapina and in other cities throughout Croatia. 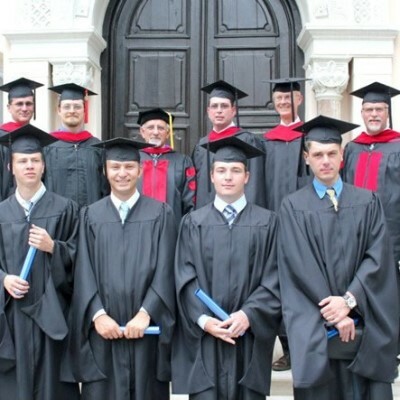 In the past twelve years, our lecturers have made available theological training by extension in Cakovec, Sisak, Split, and Varazdin in the Republic of Croatia. Lectures have also been held in the Republic of Bosnia and Herzegovina and in Slovenia. Our heavenly Teacher, the Lord Jesus commanded that we should "make disciples [i.e., disciples of Christ] of all the nations" (Matthew 28:19). The Apostle Paul commanded Timothy that "the things that you have heard before many witnesses, commit to faithful men who will be able to teach others also" (2 Timothy 2:2). We take these commands very seriously, and thus we will follow the educational method modeled by our Lord Jesus and the Apostle Paul. There is no question that small fellowships and all churches within Reformation heritage need to generate spiritually qualified leaders, who know how to lead the church in the third millenium. Our desire is that TBA would contribute fully to elevate the spiritual profile of the majority of our churches and to equip individuals to meet a higher spiritual qualification for pastoral ministry in the church. Aware that without the support and cooperation of our churches and their spiritual leaders this project will not be able to survive, the leadership of TBA counts on you, and hopes that you will also count on TBA. Only with our combined efforts and resources will this offer of theological-biblical education be able to adequately answer to the spiritual challeges which the Lord has placed before us.